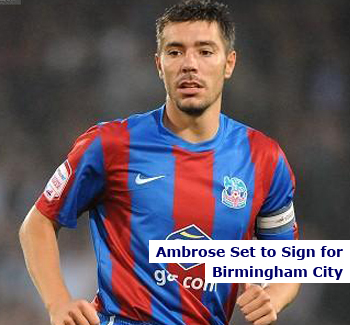 Lee Clark is to keep on keeping on in the transfer market by signing midfielder Darren Ambrose from Crystal Palace. Clark has only been in the St Andrew’s hot seat for a couple of weeks, but has already secured the services of forward Peter Lovenkrands, keeper David Lucas and midfielder Hayden Mullins. He has also added goalkeeping coach John Vaughan to his back room staff from Huddersfield Town. It is understood that Blues and Palace have agreed a fee in the region of £250,000 for Ambrose, who has one year remaining on his Selhurst Park contract. The 28-year-old began his career at Ipswich Town and has also played for Newcastle United and Charlton Athletic. The Harlow born midfielder has also represented England U-21’s on 10 occasions. This entry was posted in Birmingham City. Bookmark the permalink. According to Colin Tattum the fee is not agreed, so this deal may not happen, we’ll see. Also according to reports, midfielder Robertson from Dundee Utd is on trial at Blues. Blues also after loan for Afobe from Arsenal who has just played alongside Nathan Redmond at Euro U19 Finals and also was on loan at The Terriers under Lee Clark.